Over the 30+ years that Bridge has been in the field of English language teaching, we’ve seen firsthand the industry’s evolution and the growing diversity of English teachers in countries worldwide. Global language teachers continue to represent a range of educational and professional backgrounds, personal experiences, and teaching goals. As an established and accredited educational institute, Bridge helps current and prospective English language teachers reach those goals by providing high-quality TEFL/TESOL training and certification. Through our online, classroom-based, and blended programs, we prepare teachers of English as a foreign language to enter the classroom, or teach English online, with expertise and confidence. Our TEFL websites, BridgeTEFL and TEFLOnline.com, offer similar but tailored resources for teachers. 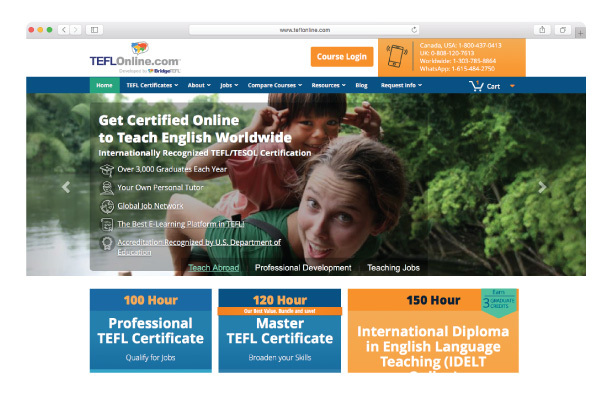 TEFLOnline.com is a valuable resource for the TEFL-traveler looking to become an effective and fully certified English teacher in preparation to live and work abroad. 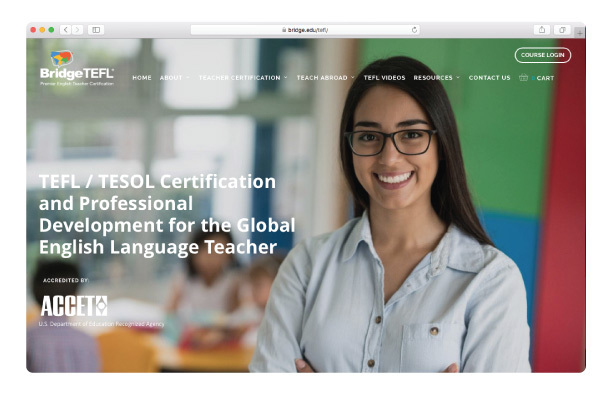 This site features our variety of TEFL and TESOL certification courses to qualify teachers for jobs abroad, including self-study online courses and courses offered in-person in countries around the world. TEFLOnline also highlights our supportive Teach Abroad Internships, which provide opportunities for new teachers to gain overseas teaching experience in a supportive setting. BridgeTEFL.com is aimed at career English language teachers seeking either initial TESOL/TEFL certification or ongoing professional development to enhance their existing credentials. In addition to featuring a range of TEFL/TESOL certification programs, such as online TEFL certificate courses, TESOL diploma programs that offer university credit, and in-person TEFL programs at Bridge centers, this site highlights specialized training for current teachers, including Certification in Teaching English Online. All courses are brought to you by Bridge Education Group, a leader in English Language Teaching with 30 years of experience training students and teachers worldwide.